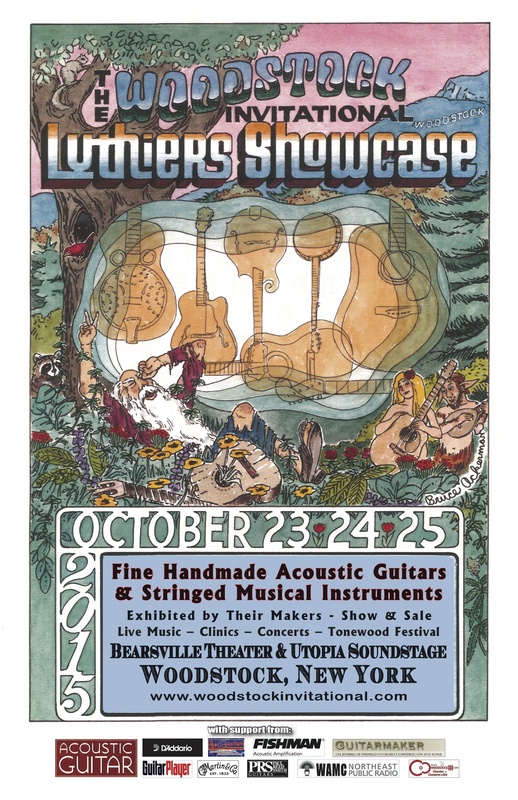 The Seventh Annual Woodstock Invitational Luthiers Showcase (and Tonewood Festival) will be held October 23, 24, and 25, 2015, at the Bearsville Theater and Utopia Soundstage, 291 & 293 Tinker Street, Woodstock, NY 12498. 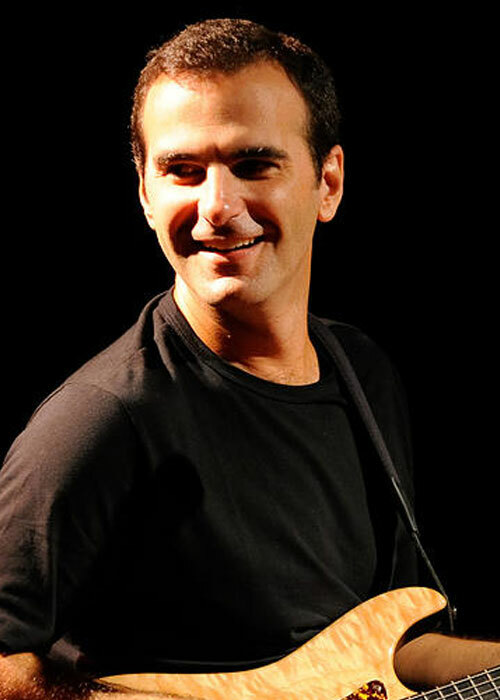 The Woodstock Invitational is an alternative guitar show, featuring fine, contemporary, handmade acoustic guitars and stringed musical instruments, exhibited by their makers. The Woodstock Invitational Luthiers Showcase is an intimate gathering for the community of acoustic stringed-instrument builders, players, collectors and aficionados, and has become one of the premier events of its kind in North America. Fine, handmade acoustic instruments such as these are not usually available in music stores or other retail environments. This is a rare opportunity for the public to see, hear, play, buy or commission custom-made instruments – the finest examples of the luthiers’ art – gathered together in one place. Nylon-string classical and flamenco guitars, steel-string guitars – flattops, archtops, manouche, resonators, hybrids – plus mandolins, lutes, ouds, ukuleles, banjos, and stringed oddities will be on display in the Bearsville Theater. Other vendors include tonewood dealers, parts and tool suppliers, string and accessories manufacturers, publications and instructional materials, our Sponsors, plus Special Exhibits of rare and significant historic, vintage and contemporary instruments loaned by collectors and institutions, all right next door to the Bearsville Theater in the Utopia Soundstage Vendors Annex. In the “Tonewood Tent” in front of Utopia Soundstage, in conjunction with Northwind Timber, is Tonewood Festival, a pre-Showcase shopping opportunity featuring a number of fine tonewood dealers, open to the public with free admission on Thursday October 22, and continuing Friday, Saturday and Sunday October 23, 24, and 25. There is continuous live music, including luthier mini-concerts, demos and special appearances during show hours, 11:00 AM to 6:00 PM Friday, Saturday and Sunday, by some of the nation’s finest musicians, in the Bearsville Theater Lounge, included in the price of admission. There is a series of Instructional Clinics and Workshops for players, plus seminars and colloquia for builders, by separate admission. Plus our annual String Sampler Concert of acoustic music featuring internationally known artists, by separate admission, Friday, October 24 at the Woodstock Playhouse. Click here to visit the official Woodstock Invitational site. Hey guys, Neal here. Here’s my overview of The L.A. Amp Show last weekend. I met with JP Cervoni, he had our Rockready Volo on display. I tried out the amps he was using there, Mezzabarba (big Italian name) and they rock, def a big rock tone. I got to play a ’61 Strat that Jeff Beck wanted to buy for $70k but was turned down (so they say). I ran into Larry Mitchell there too and introduced myself, took some picks, super nice and cool dude. Something The L.A. Amp Show did new this year is that Guitar Center rented out all 3 banquet rooms and basically made a mini GC with high end boutique amps and some vintage guitars on hand. The stage was loaded with Freidman Amps.